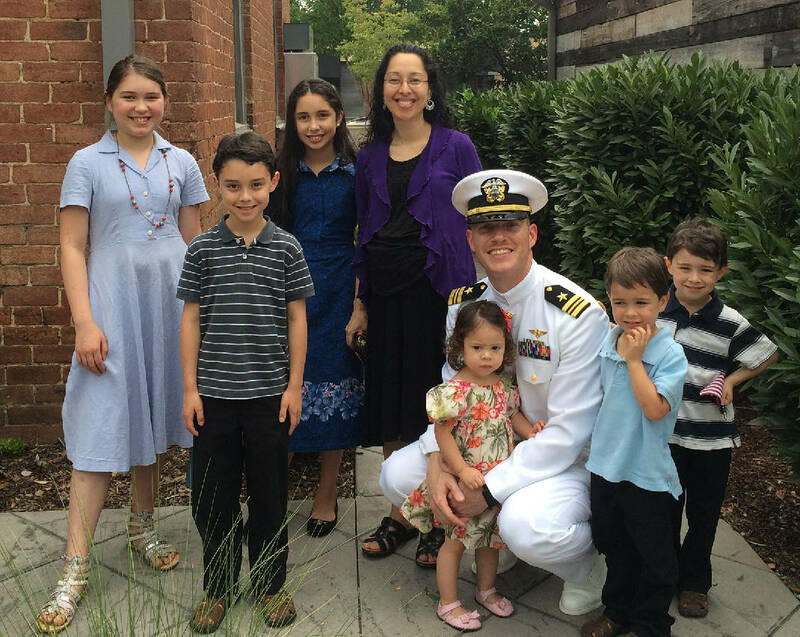 Lt Commander Timothy White is pictured with his family. POLL: Should Lt. Cmdr. Tim White be honored? When Mohammad Youssef Abdulazeez attacked the U.S. Naval and Marine Reserve Center on July 16 with a handgun and an assault rifle, Navy Lt. Cmdr. Tim White opened fire. White used his personal weapon to try to fend off Abdulazeez, he confirmed to the Times Free Press on Thursday. Abdulazeez killed four Marines and a Navy specialist in the brazen daytime attack. White, who has served in the Navy for 13 years, moved to Chattanooga in April with his wife and six kids — and a seventh on the way. As the commanding officer at the center, White is limited in what details he can release because of the ongoing investigation into the attack. But his wife, Franicia White, said she supports her husband's actions that day. "He values human life enough to protect his sailors and others," she said. "I am honored to be his wife and stand by him 100 percent." The July 16 attack sparked a national debate about whether military personnel should be armed in military buildings on United States soil. Currently, Department of Defense regulations prohibit most service members from being armed on U.S. soil, including most personnel at reserves and recruiting centers like the ones Abdulazeez targeted in Chattanooga. Only law enforcement or service members who are acting as military police are allowed to carry weapons on such properties. On Thursday, Secretary of Defense Ash Carter directed the military branches to review security policies — including adding armed personnel — in the wake of the Chattanooga attacks, The Associated Press reported. In a news conference days after the shooting, FBI Special Agent Ed Reinhold said the FBI recovered two personal weapons from the scene but declined to say whether the service members who had those weapons were authorized to carry them. On Wednesday, a Florida resident named White in a petition that asks President Barack Obama to honor the men who fired their personal weapons at Abdulazeez. The petition, which had more than 700 signatures Thursday, asks Obama to give the men who fired medals of bravery for saving lives during the attack. "What he did there was a very brave thing," said Michael Seewald, a friend of White's who signed the petition. "It would be so easy for somebody to just try to get away and escape, but he tried to defend the people there. I'm not sure that was in the protocol for what they were supposed to be doing, but I think he felt he had a responsibility to protect his people." Filed on the White House website, the petition must reach at least 100,000 signatures by Aug. 28 in order to get a response from the White House. And although two weeks have passed since the attack, it's still unclear whether White's shots actually wounded Abdulazeez. Days after the shooting, Reinhold confirmed that one service member spotted Abdulazeez as he approached the building and opened fire on the 24-year-old Hixson man, but he could not say whether those bullets reached their target. The FBI has not released the identities of the service members who fired. After the shooting, many politicians immediately called for a change in policy to allow more service members to be armed. Within two days, six states either ordered their National Guard recruiting personnel to be armed or ordered those in recruitment relocated to armories or similar facilities. Gov. Bill Haslam ordered Tennessee's National Guard storefront centers to temporarily relocate into armories four days after the shooting. Two days later, a Department of Defense spokesman said the Pentagon has no intentions of changing the rules. But the AP reported that Carter said in a memorandum released Thursday the military should develop plans that include the option of armed personnel. He reminded the military service chiefs that existing policy allows for armed personnel for security, law enforcement and counterintelligence duties. "The tragic shooting on July 16 in Chattanooga, Tennessee, illustrates the continuing threat to DOD personnel in the U.S. homeland posed by homegrown violent extremists," Carter wrote in a memo released Thursday by the Pentagon. The Associated Press and McClatchy contributed to this report.